"I think (sic) we ought to suspend, perhaps, elections for Congress for two years.... I really hope that someone can agree with me on that." f course, it sounded so much better in the original "Austrian" German. It's not hard to imagine the reaction of the Mud Slinging Media (D-USSA) had a Republican governor spewed such nauseatingly fascist filth. But because one of their own spewed it, you'll hear as much about this as as you did about their Øbameinführer's "intercontinental" railroad that allows Navy corpsemen and even the "President" of Canada to travel across the ocean by rail from our "57 states" to those places in Europe where they speak "Austrian." Herman Cain is a longtime, extraordinarily successful business leader. Baracrook Øbungler is a long-winded extremist and miserable failure. Within 14 months of becoming President and CEO of Godfather's Pizza, Herman Cain returned the company to profitability. 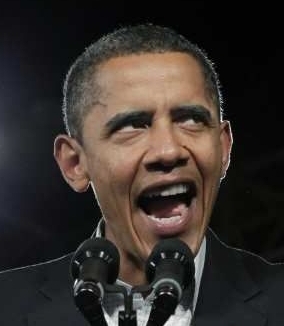 Within 14 months of becoming pResident and Telepromptee of the United States, Bigjerk Øblamer wrecked the country with extremely high unemployment, budget deficits, and mountains of unrepayable debt. Under Herman Cain's leadership, all 400 of his Burger King stores went from least profitable to most profitable in just three years. Under Fup-uck Øherberthoover's misleadership, all 50 of his "57 States" went from regular recession to The Great Recession™ in less than three years. Former Navy mathematician Herman Cain is a rocket scientist. Current nefarious politician Blockhead Øblew-it is dumber than a bag of rocks. Herman Cain has bought a business and actually created or saved private-sector jobs. Backpocket Øbonehead has been bought off by his Big Union boss buddies and maniacally destroyed and lost us millions of jobs. Herman Cain was on the board of directors of Aquila, Nabisco, Whirlpool, Reader's Digest, and AGCO. Benedict Øbarnold is on board with the likes of domestic terrorist Bill Ayers, thug group SEIU, voter intimidators "New" Black Panthers, "amigo" dictator Hugo Chavez, bailed out Solyndra crooks, and Jew-murdering Hamas. Herman Cain's common sense plan to reform our taxes will be a welcomed blessing to all Americans — the one long awaited by every taxpayer — and has been labeled "9-9-9." Beelzebub Øtaxandspend's extremely insane plots to raise our taxes has been a dreadful curse on all Americans — øne that is constantly weighing on every taxpayer — and thus should be labeled "6-6-6." As associate minister at Antioch Baptist Church North in Atlanta, Herman Cain regularly attends church on Sundays. As "former" member of Racist "Reverend" Jeremiah "God D––– America!" Wright's "church" radical socialist commune in Chicago, Barassholefreak Ødowngrader regularly goes golfing on Sundays. 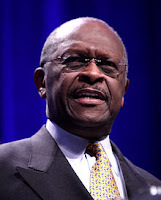 For liberal bigots(birm) who judge people by the color of their skin: Herman Cain is all black and all American. Bedroom-slippers Øracist is half white, half Kenyan, all Marxist, and øne who has zero character. Solyndra Inc., which manufactured solar panels at its plant in Fremont, Calif., received $535 million in Energy Department loans, and President Obama talked glowingly about how the company was "leading the way toward a brighter and more prosperous future." Instead of creating work for Americans after receiving taxpayer money, the company shipped half its manufacturing jobs to China. In August, Solyndra declared bankruptcy and laid off 1,100 workers. The bailout that General Motors received from the government came with a price: The carmaker was tasked to create the ultimate green vehicle. The result — the Chevy Volt — is a product with an exorbitant price tag that nobody wants to buy. Despite vast government subsidies, GM only sold 3,200 cars in the first eight months since the electric plug-in vehicles hit the marketplace. Evergreen Solar Inc., of Massachusetts, which received $58 million in stimulus money and other government largesse, filed for Chapter 11 bankruptcy in August and closed its plant in Midland, Mich. Not being able to compete against the Chinese and their low-wage workers, the company racked up $485 million in debt and cut 800 jobs, with more cuts to come as the company restructures. The city of Seattle received $20 million in federal stimulus money to help homeowners make their houses more energy-efficient. Some 16 months later, 14 jobs were created and three homes were weatherized. Most of the money went to a company to train workers to weatherize buildings, but the lack of demand for the service meant those trainees had no work to do. After Obama's stimulus package doled out billions to subsidize the weatherization of homes, the Labor Department delayed the project by seven months while it determined the prevailing-wage standards for those green jobs — a sop to the President's union supporters. That is just one reason why the program turned into a miserable failure. In its first year, the program spent $508 million to create 600 jobs and update 9,000 homes nationwide. Johnson Controls, which manufactures batteries for electric and hybrid cars at its plant in Holland, Mich., received $300 million in taxpayer help and created a grand total of 150 jobs — or $2 million per job. That must qualify as a huge success in the green-job world, as President Obama visited the facility in August, using the trip to attack Republicans and a "do-nothing government." Yes, Mr. President, sometimes doing nothing is preferable to shoveling money into a hole. Clark County, Nev., which happens to be the home of the gambling mecca of Las Vegas, received $490,000 in stimulus money from the U.S. Forest Service to plant trees in urban neighborhoods (more palm trees on The Strip?). The stimulus that resulted from the grant to Senate Majority Leader Harry Reid's home state created 1.7 jobs (one full-time employee and one part time) and 11 temporary jobs. You get a better return for your money at the slot machines. o, our country can't afford any more such extremely Øburdensome wastes, frauds, and abuses. Four grueling years of them and him are enough! Fool us twice, shame on We the People. hat do you take us for, Baracrook Øbuttmunch? You're wanting to do the exact same "shovelready" things you've been doing for to us over the last two and a half years, but make us believe that this time it'll be different? That your new Stinkulus "plan," unlike your old Stinkulus, will for the first time in your alleged presidency get the job done of actually getting us jobs? What are you going to say this time? That without your Stinkulus, Jr. our unemployment rate will be a zillion percent, but with it "only" 25 percent? Or are you going to be telling us once again, not too many months from now, that "shovelready was not as shovelready as we expected. Ha!-ha!-ha!-ha!-ha!"? Just like you did with your Stinkulus, Sr.? We'd each have to be as stupefyingly daft as you and your whole "economic" team insane asylum put together before yes we can expect your repeated boondoggles to produce any results other the same old corrupt-slushfunded ones you've been assaulting us over and over and over with since you dropped your last Stinkulus bomb on us. The only shovelready job that can possibly give our county its first real hope of ever again seeing the long-term creation and saving of any actual ones is working to get the massive change in personnel we need at both 1600 Pennsylvania Avenue and the north wing of the United States Capitol. Unlike any under your twin Stinkulus "plans," there's a date certain on which that job will be successfully and satisfyingly completed — namely, Tuesday, November 6, 2012. Long version: Always run a company that criminally refuses to pay its taxes on time, while blatantly lying about your own tax payments and those of others. hort version: Be a flaming hypocrite. Come on, Warren. It's really very simple. You don't even have to wait for any new law. You can rest assured every penny of your gift will be spent by your dEar Leader Ohr Führer on his Stinkulus, Jr.™ "plan." Should be enough, given his record, to Create Or Save® nearly 14 jobs. That is, after his big public sector union-boss buddies and other Demøcrook special-interest NSDWP front-group cronies, as well as all the thousands upon thousands of new federal agents, bureaucrats, and other government "workers," get Their Fair Bribe Cut™, of course. Which Party Drove Our County into the Ditch? The red shows all their extreme spending they've put on our public credit card. 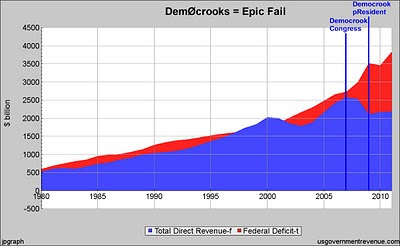 DemØcrooks swore it would "jumpstart" our economy. Under this misadministration, medium household income is worse than it's been in 15 years! Øbungler thinks feels stealing another $50 billion a year from millionaires will leave any of us better off? Øbamaniac and his fellow loons in Congress clearly have no clue how to jumpstart a tiny lemonade stand, let alone the largest economy in the world! 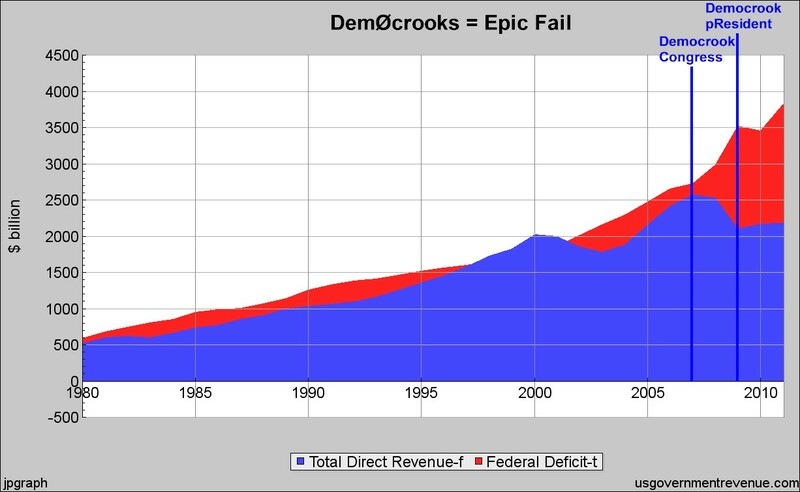 You'd think that, after making our country go to hell for so long, DemØcrooks would've by now at least tried to go to Texas to see how real "job creating and saving" is done. That's wildly assuming, of course, DemØcrooks were ever really interested in creating or saving any jobs at all (besides their own). So far there's been absolutely no clear and convincing evidence of that. Big Dem Donors get by with a little lot of help from their friend... in the Den of Thieves Øval Øffice. There are indications the general's presentation [to Congress] was leaked to executives at LightSquared before he gave his testimony, and sometime after that the White House attempted to alter the substance of the presentation to favor LightSquared. LightSquared is funded by Harbinger Capital, a hedge fund owned by Philip Falcone, a major donor to the Democratic Party. LightSquared's CEO, Sanjiv Ahuja, is also a major donor to the Democratic Party. More of the same old tired tax-and-$pend(-on-bribe$-for-vote$) liberal crap. emember all the jobs "created or saved" by Øblamer-in-Chief's Stinkulu$, Sr. bill? When His Fraudulency™ put his marX on that steaming pile of dønkey dung, he promised it would lower the unemployment rate to below seven percent by this year. 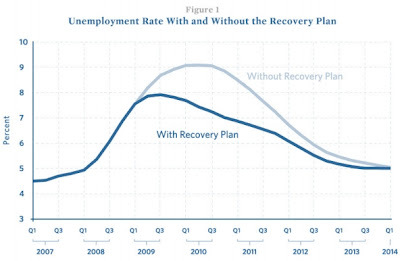 As Figure 1 shows, even with the large prototypical package, the unemployment rate in 2010Q4 is predicted to be approximately 7.0%, which is well below the approximately 8.8% that would result in the absence of a plan. Today, the unemployment rate is still over 9.0%. That's in the presence of His Shovelready Joblessness's Stinkulu$, Sr. "plan." Now His Wayoverhisheadness™ wants to drop on us anøther of his massively smelly turd$ that's almost as large as his fir$t øne? Maybe he thinks feels we haven't been thanking him enough for ramming that last monstrously putrefied piece of unprecedented poopage down all our throats. All for nothing, too. Except for paying off bribing Øbamalodorousness's Big Union Boss buddie$ and libfreeloading special interest cronie$ and lobbyist$, of course — using our money! — while mercilessly leaving us ever larger and larger budget deficits and higher and higher mountain chains of public debt. Yeah. Thank$ a lot, Ødoo-doo. We, our children, our grandchildren, and even our great grandchildren are going to be so grateful when the unpayable bill$ come in for that Mount Everest of ØbaManure™. Yes You Can just scrape that gangrenous glob of fetid feces off your TelePrompTers and cram it right back up your shovelreadied Big Gov Gølfernment 18th hole. One Øbamalignancy™ has been quite enough. Our country cannot afford any more. "Success story" Solyndra, another Øbamiserable Failure and Baracrook Fraud. alf a billion more taxpayers' dollars destroyed and lost. Still think feel we should be "thanking" you, Øcriminal? You can go straight to hell (© 2011 Marxine Warters). You're a full-blown economic terrorist and Public Enemy Nø. Øne, Øbarbarian-at-the-Gate. The people who love America — i.e., not you or any of your fellow extremists and crooks, Øhostage-taker-in-Chief — are our army. And we're already marching. You might even say that we're proudly saying, "Let's take this SØBama out and give America back to an America where we belong" (© 2011 Commierads Høffbama). Ja, wir können... Bericht, den Sie auf unseren geliebten Führer! "Obama has presided over the single largest drop in income for the poorest Americans." "Black Americans in the lowest income quintile have suffered almost TWICE as much as the average American in the same quintile under Obama: -11.58% to -6.04%." That's right. Half-whitey BaracKKK Hatin'blacks ØbigotMmm,Mmm,Mmm is a hate-filled racist. APee: "pResident Barack[lutz] [Zer]øbama's promise [sic] Thursday that everything in his jobs [sic] plan will be paid for rests on highly iffy propositions.... [Zer]øbama chose a joint session of Congress, normally reserved for a state of the union speech, to lay out his proposals. But if the moment was extraordinary, the plan he presented was conventional Washington rhetoric in one respect: It employs sleight-of-hand accounting." hen the APee your own Official Cheerleading Squad® throws down a giant BS Flag™ on your speech campaign photo-op, you know you've been caught commie-red-handed. Illegal formation, illegal motion, illegal use of hands, offside, personal foul, delay of game, and unsportsmanlike conduct. At this rate, JØKEbama, the pollsters will soon have to start using negative percentages to rate your approval.